There is something that I like very much about the way this turned out. I am unsure what it is. 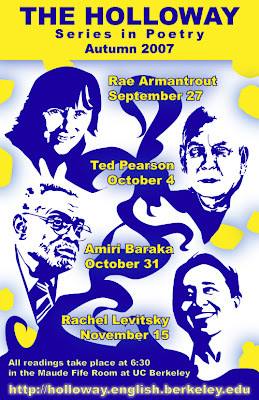 Rae Armantrout, Ted Pearson, Amiri Baraka, and Rachel Levitsky. It is very cool to be in a place where you can meet poets like these. I think it will be the last poster I do in Gold and Blue. I hope that Amiri Baraka, Rae Armantrout, Rachel Levitsky, and Ted Pearson like it as much as I do. I hope that you like it, too.